Musical history was made Jan. 26, 1940 when a scrawny baritone from New Joisey stepped to the microphone in front of Tommy Dorsey’s orchestra. Francis Albert Sinatra’s six decade career is celebrated in the musical revue “My Way: A Musical Tribute to Frank Sinatra,” a cure for December doldrums from What’s That Smell? Productions at The Box Theater. Sinatra said that the secret of his success was to “sing good songs.” Indeed he did sing great songs, from tunesmiths Rodgers & Hart, Kander & Ebb, Arlen & Mercer, Kahn, Cahn, Kern, Coleman and Berlin, just to name a few of the composers represented by the 57-some songs featured in “My Way.” The music is grouped by themes, and the medleys comprise at least the choruses of some of the best know numbers in popular music. “My Way” was conceived by David Grapes and Todd Olson, and features a rather incidental book, by Olson, that acts as a bridge between selections. Arlen and Mercer’s “That Old Black Magic,” which has a definitive poetic meter in the lyrics, became something of a tropical dance number. Conversely, Cole Porter’s lyrical “I’ve Got You Under My Skin” ended up with a syncopation that doesn’t match the mood. But art criticism is subjective; enough music lovers disagree with me that Sinatra’s formidable presence preserved Big Band and Swing for two generations beyond their time. The critic is very fond of Big Band! The Box Theater in Mt. Clemens is too small for a big band, but a jazz trio, under the direction of Laura Quinn, makes up in proficiency what it lacks in numbers. With bassist Richard Bright, David Zwolinski on drums and Jacqueline Koehler at the piano opening night, the sound was rich, bright and balanced. 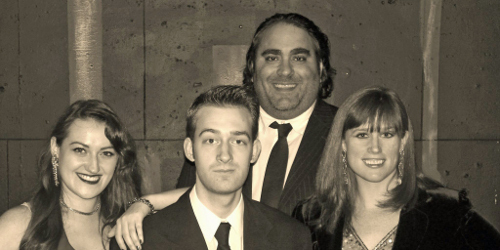 Stage director Mark Konwinski presents four vocalists: fiery redheads Kryssy Becker and Bronwen Hupp, ably abetted by John Forlini and Tim Stone. The quartet certainly has the substance of Sinatra, but not quite the laid-back, deceptively effortless style that the Chairman of the Board brought to his stage presence. Unfortunately, the performance reviewed was fraught with technical difficulties that would addle the composure of even the most seasoned performer. But music lovers of a certain age – and it’s a pretty broad range – left the theater singing favorite numbers. Frank Sinatra had a favorite toast: “May you live to be a hundred and may the last voice you hear be mine.” There’s no doubt they’ll be listening to Old Blue Eyes for centuries to come.